Yes, the Lord pours down his blessings. Our land will yield its bountiful harvest. I am always amazed with the way the Lord blesses us with little answers. 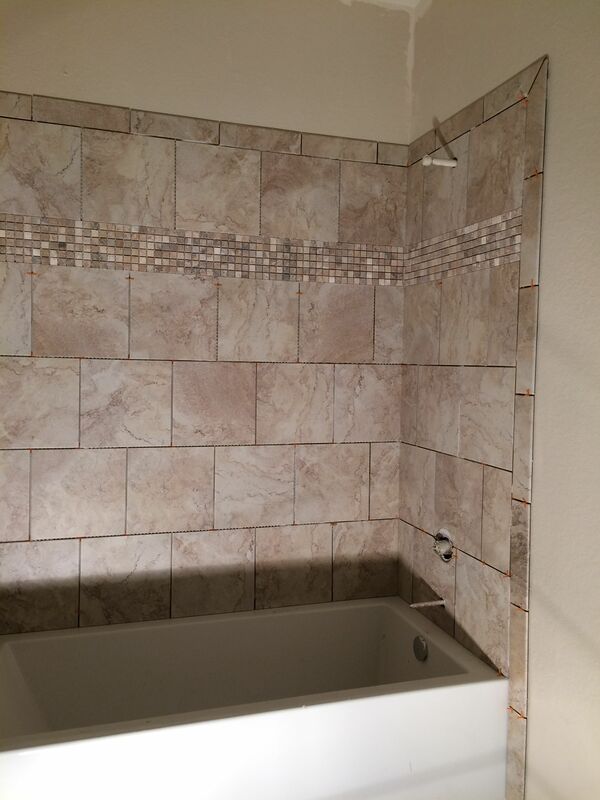 Prosource received most of our tile order and Juve and his tile guys tiled our guest bathroom and most of our tile floors. 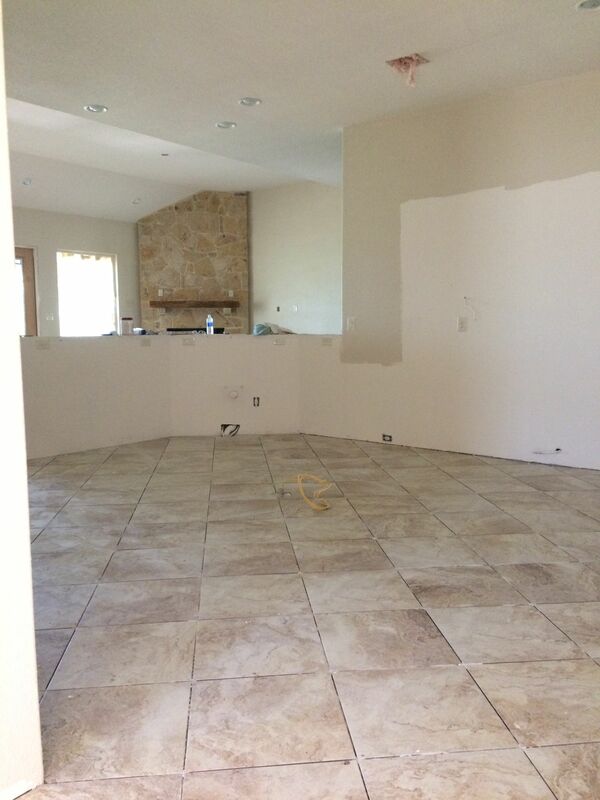 Some of the tile was on back order but it came in Thursday (an answer to a little prayer) and Juve’s guys should be back out again today to finish the laundry room and our master bath. A&M Electric and Trenching installed all of our canned lighting and set up power to the house. Once our driveway and AC pad is poured, they will be back out again to install all of the light fixtures. 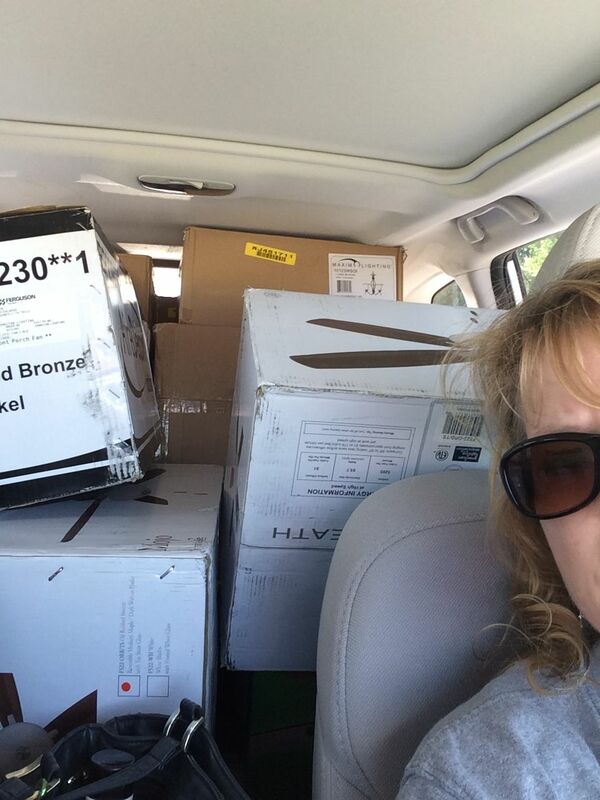 I stopped by Ferguson and picked up a load of our fans and lights when I was over on that side of town. We have all of them except for a couple of lights on back order, track lighting I will pick up from Home Depot today, and the under the counter lights I still need to pick out. Bill’s Cabinet Shop finished our cabinets about a week ago and finally, with most of the painting and tile done, we were ready for them. They delivered on Tuesday. Jon and I were a bit overwhelmed as the delivery guys unloaded them into our garage. 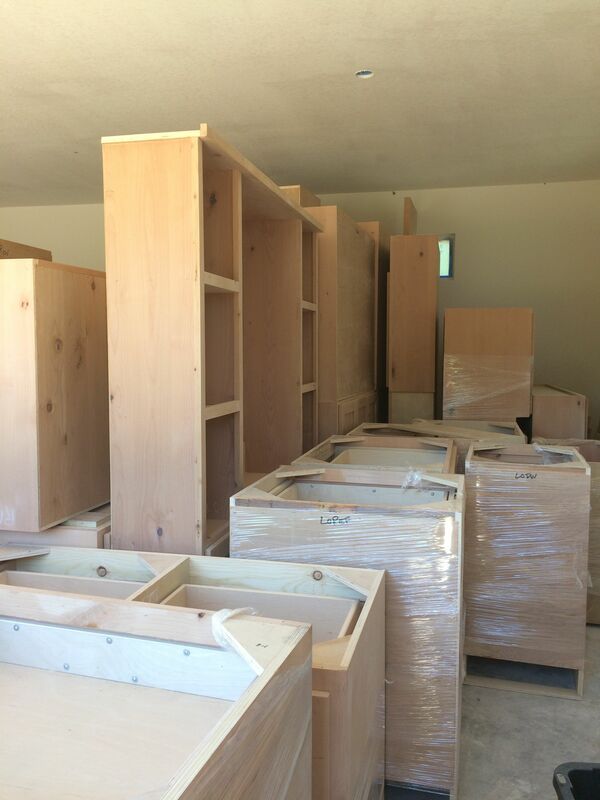 Since the beginning, we planned to install and stain the cabinets ourselves. As we surveyed the work ahead of us, thankfully, Jon and I were of one mind: contact Fernando and get an estimate for staining. He came by the next morning and gave us a price within our budget. We are quite relieved to not have to tackle this daunting task and I am actually looking forward to restaining of few pieces of our furniture in the future. 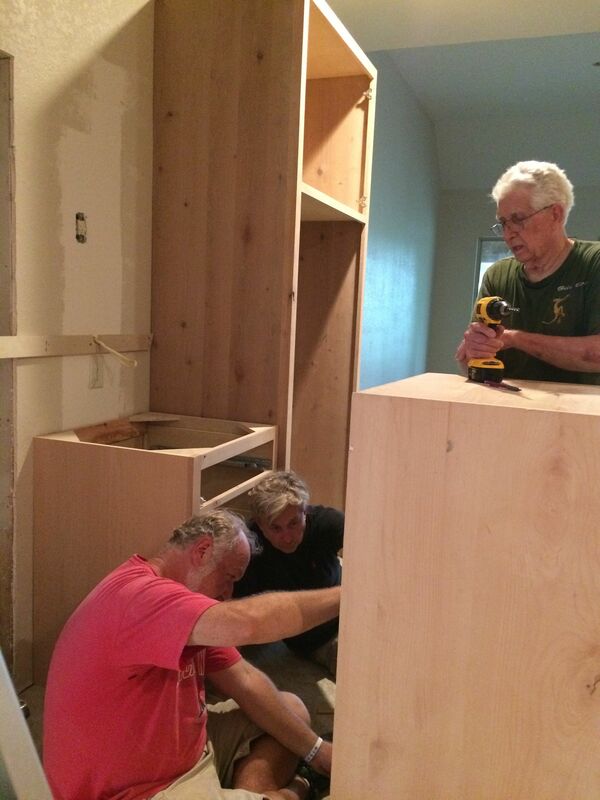 A very dear friend of ours, Rick Jones, and Jon’s dad showed up Wednesday morning to install the cabinets. Jon could not have done it without them and we so appreciate their hard work. I’ve never had custom cabinets before and I have to admit, they were different than I expected. For example, rather than a mere cabinet to install over the refrigerator, we have a cabinet frame for the refrigerator with the upper cabinet attached. Same thing for the double ovens. 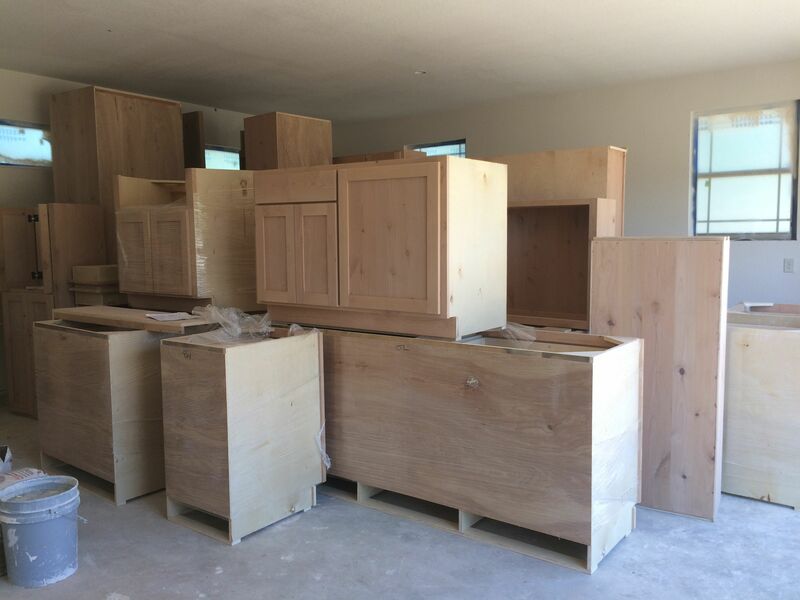 And instead of small sections of cabinets and drawers, we received large sections built together. Jon and I finished the island on Friday; it fit together like a jigsaw puzzle. 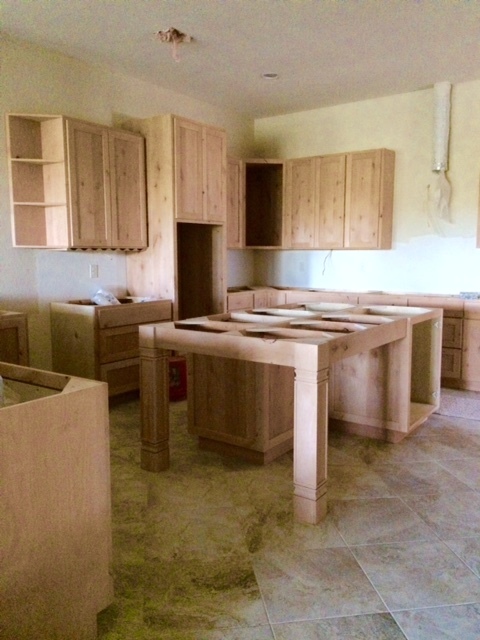 The workmanship of the cabinets and the wood (knotty alder) are beautiful. Our house is beginning to look like a home. Ferguson also delivered the remaining plumbing hardware this week, however my farm sink was damaged. After a couple of quick calls, we’ll have the new one delivered on Monday. Which is very important because the San Antonio Granite Works and Universal Form Tops will be out to make templates for our counter tops. Hollywood Crawford will also install our garage door (another answer to a little prayer). Still so much to do, but we should be about six weeks out from completion. We’ve been in contact with Supreme Lending and Navy Federal with regards to our mortgage. Navy Federal has great mortgage rates right now, but Supreme Lending (who helped set up our construction loan with Sonora Bank) was able to come back with some competitive numbers as well. Time to start filling out the paperwork. We already love living out here in River Chase. We’ve talked to several neighbors on our street and we look forward to having a house warming party and getting to know everyone. Jon and I have also spent several early mornings sitting out on our pack patio, enjoying our coffee, watching the deer, and listening to the birds. Indeed, the Lord pours down His blessings and I am thankful. 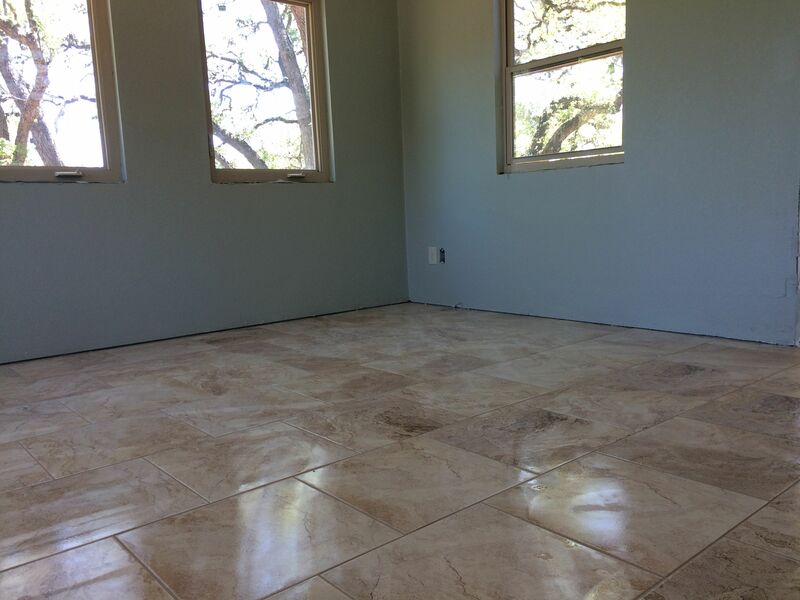 This entry was posted in Hill Country Living and tagged A&M Electric and Trenching, Bill's Cabinet Shop, Country Living, Ferguson, Fernando Delgado Painting, Hollywood Crawford Garage Doors, Navy Federal Credit Union, ProSource Wholesale, River Chase, San Antonio Granite Works, Sonora Bank, Supreme Lending, Texas Hilll Country, Tile Work by Juve, UBuild It, Universal Form Tops. Bookmark the permalink.